One thing I've learned in living in this new house, that's smaller and "Open Concept", is that keeping a sense of "flow" is very important. Having a Kitchen, Living Room, Entry Hall and Dining Room that are all one big space can present some challenges in decorating. I have a lot of furniture, and some of it is big, but then I have some smaller "accessory" type pieces too. I'm also using a different "color palette" here...grays and taupes. At the old house, there was a lot of cream and lighter and darker variations of "cream". I also had white woodwork and moldings at the other house, which I loved. Here the woodwork is some shade of off white. not my favorite. I learned early on that some of my distressed "white" pieces were not going to work here. Case in point was my coffee table and end tables. They are big heavy curvy frenchie solid pieces and they just looked dirty and too big. 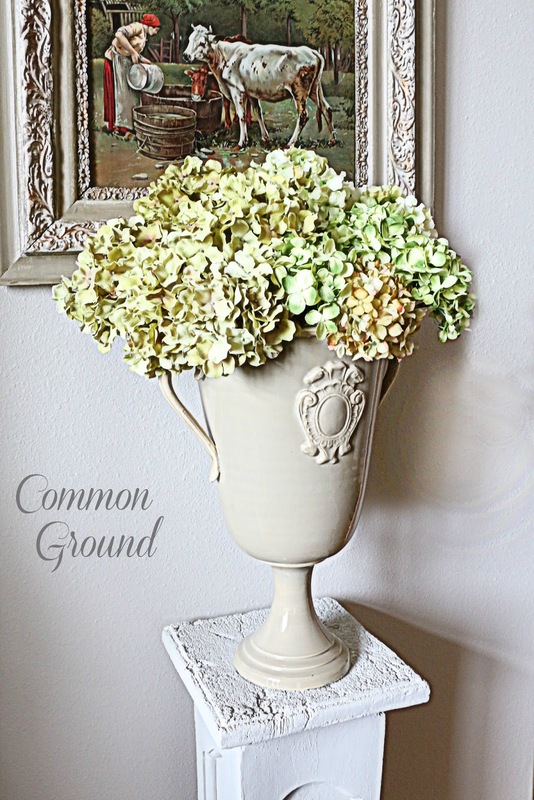 Paint came to the rescue in using a mix of French Linen and Coco ASCP. Once they were painted they blended in and receded to the background instead of poking you in the eye. The same goes for some of my smaller pieces and accessories. 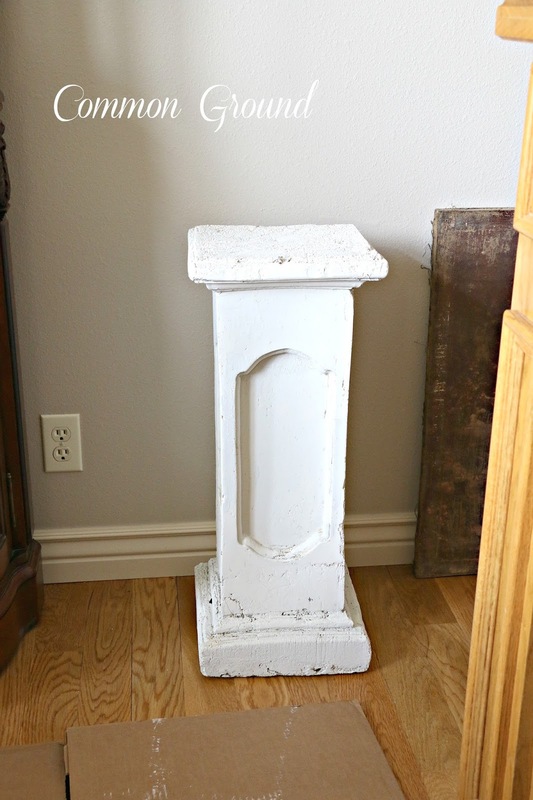 I'd been waiting for this little vintage concrete/chalk pedestal to be located at storage. I was excited to bring it home, since I knew right where it needed to be. But once here, the stark white up against the wall color was way too noticeable. Out came my paint. A very subtle change, but one that is a much less jarring. I'm using the same Italian vase that I used at the other house. It had been in the Dining Room, but I can't find any pics of it. 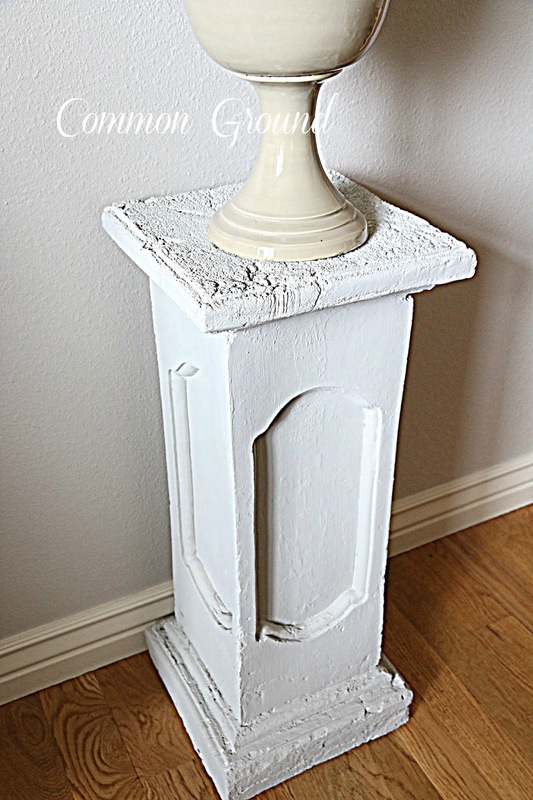 This pedestal is not really pretty, as it's kind of rough. But it's just the size I needed here. This is a little walkway toward the Kitchen, so whatever is here needs to be small and not block traffic. Visually, something needed to ground the large frame and print, but not be noticeable. This is a small space, and my furniture is big and dark. 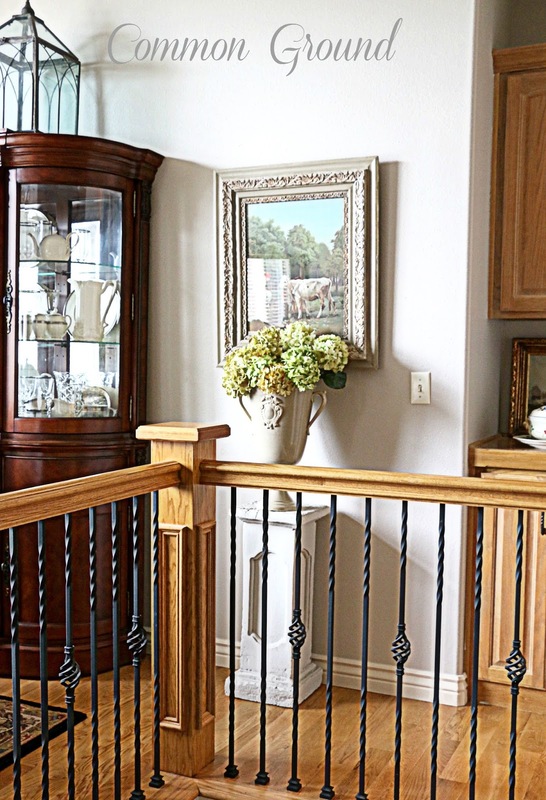 It's not the sort of layout I would particularly choose, (not a fan of the wood stain, and don't like the black iron "spindles") but I've learned that in house shopping, sometimes you have to make some concessions, and since we don't have an unlimited budget, right now this is it. I've needed to not put a lot of extras in here that distract the eye. I'm working on the potting bench this weekend. Hi Debra, your dinning room setting is just so beautiful. As for the cement pedalstool I love it, I have this chippy cement base to a birdbath that I've always wanted to do something like this to it, yet still nothing with a great fit as yours. I love the shape and the cement cracks in it. Debra, what a fabulous dining room! It is so elegant and your pedestal absolutely perfect in there! Love it. Aww, so sorry you've got to sit with the dentist awhile! 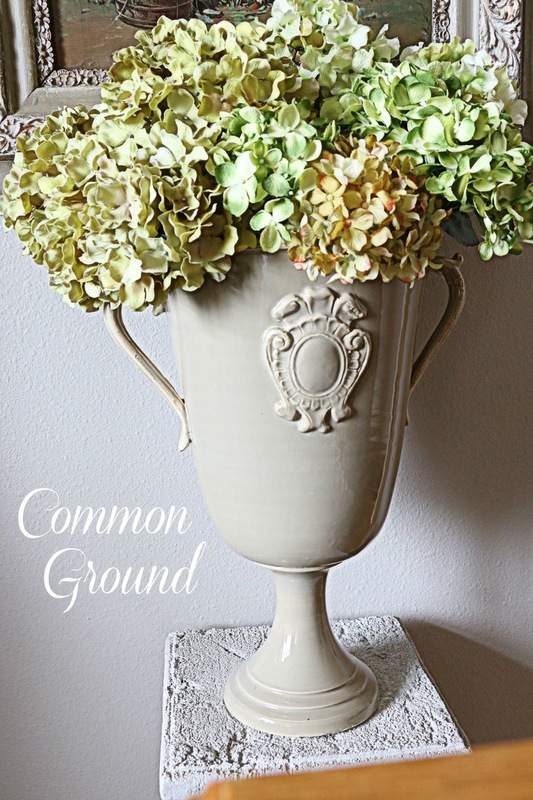 Love the pedestal, and the new color. When we paint we are going with taupes, too. Can't wait! A crown! Not fun but has to be done, right? Hope all else is good with you!! I am back to my shop and blog after an extended hiatus that resulted from caring for my MIL with dementia. Hopefully visits and sales will bounce right back. Stocking the shop over the next two weeks! I am so enjoying you decorating your lovely new home. Your dining room is gorgeous. It all flows together beautifully. Hope your dentist appt. goes smoothly! Love your pedestal. Gives such character to that space. Looks so pretty. 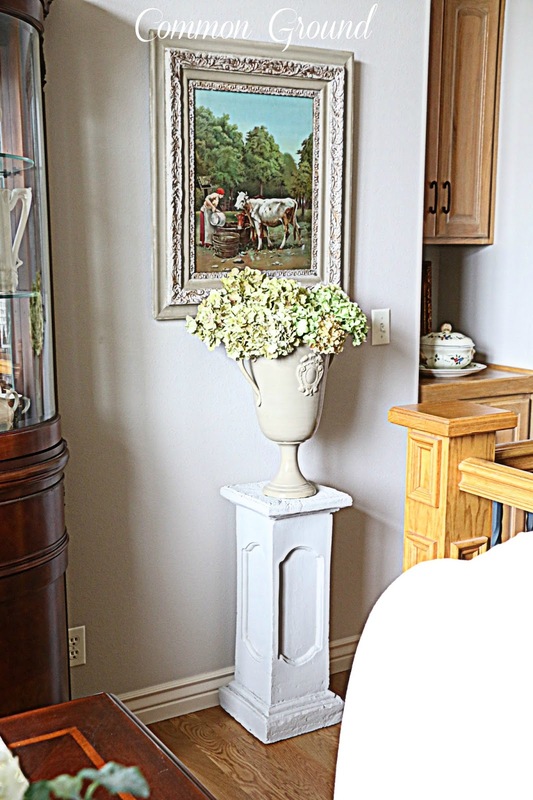 I love pedestals...yours looks great in your dining room!! You are making your home so beautiful and your style is showing through. 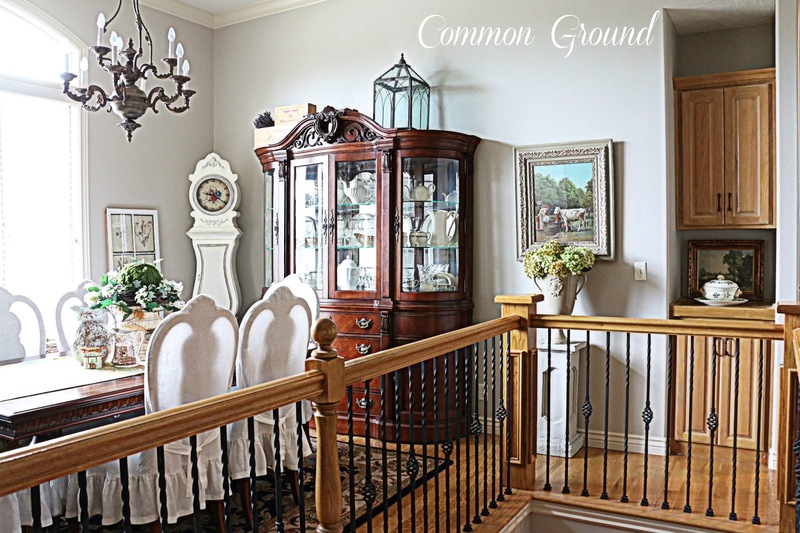 Love the pedestal and your dining area is lovely. It's not easy when all the rooms flow and it takes time to get it the way you want. I'm dealing with the same kind of layout. Good luck at the Dentist. I love pedestals! The one you're using is great in your dining room. They can be hard to find too. Glad you kept it from your last home. Hola Debora, me encanta tu comedor, el reloj, las sillas... el pedestal con sus flores. Your home is lovely and everything thing seems to be coming together. Like the pedestal very much and it looks very good there. The concrete pedestal looks amazing in the space, dear friend!!! in the design here on the Prairie. . .so pace yourself, dear one!!! Soak up some sunshine and enjoy the out~of~doors while the freshness lasts!!! Your dining room is lovely, Debra, and you've done a great job adjusting to the flow of rooms in your new home. 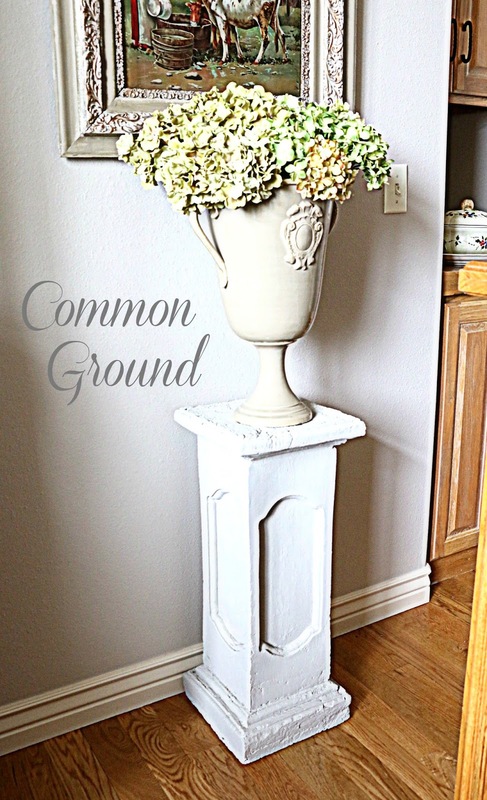 Love the pedestal that has found the perfect spot. Debra, I love that and it looks great in that spot. I'm really coveting the cow scene above it. yes it looks way better with the touch of paint you added...but I have to say I love your iron and wood railing. Its lovely. Very European. And sorry about the crown. Double ugh. Love it! 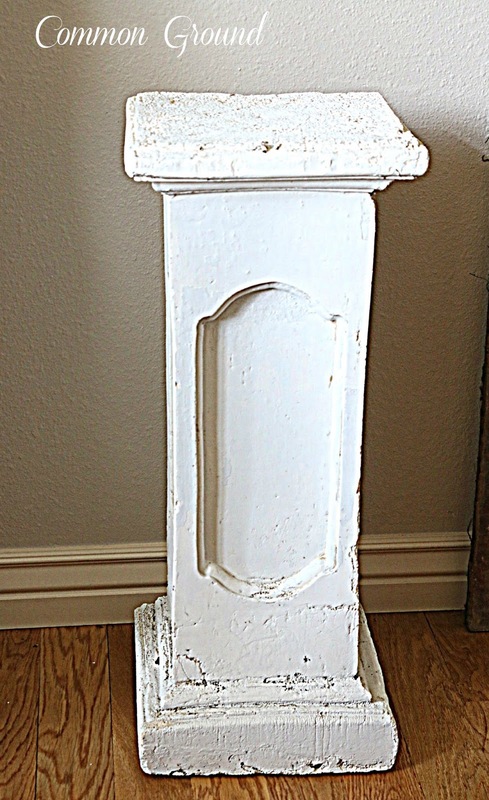 I have a concrete pedestal column in our master bath. Trying to find a place to use it after I redo our bath. Thanx for partying! Headed to yours right now. Debra, I love the concrete pedestal! That's the perfect spot for it, and I like the rustic feel of it. Our home is very open and it does present a challenge in decorating. I hear you about settling. Our baseboards are tan. I was so tempted to paint them when we bought the home 5 years ago, but it looked bran new. I decided to live with it. Everyone says how much they like it, but I love the freshness of white. Maybe when the walls need to be repainted I'll get white trim. Thanks for sharing with SYC.